I've been an regular reader of flipcode for about a year or more and been just lurking around picking up cool tips and looking at awsome pictures. The image submitted is a screenshot of the application I've been working on at Propellerhead Software (www.propellerheads.se), it was finally released last autumn. It's a music-making software. It features a number of "devices" that generates sound and has a build in sequencer. There is also free routing of the audio chain by flipping to the back side of the rack. The top left area is the front and the lower right is the back. At the very end is the sequencer. So why post it at Flipcode? It looks pretty good (imho). 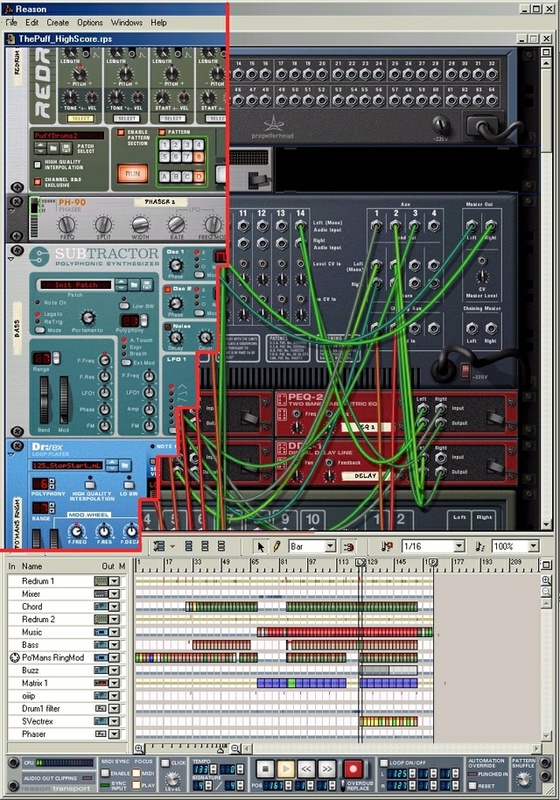 It uses a number of techniques more normal to games than music, the graphics uses alpha channels and are custom compressed, it creates sound using both algorithms and samples in real-time. Realtime physics for the cables - yes they do move pretty convincingly. We use offscreens to avoid flicker. Thanks for your time guys/girls.